Start with 5x7 Cream Colored Card Base. Trim with Cream Colored Washi Tape. Adhere 5x7 decorative frame cut from Daisy Paper. Cut smaller frame using Spellbinders Card Creator Reflective Moments using DCWV Pastel Green Foil. Type "You Light Up My Life" on white cardstock and cut out with smaller coordinating frame. Distress edges with color of choice. Using Light Bulb Die with filament, cut out two from DCWV Pastel gold foil, cut out two using Light Copper metal. Layer the edge from the copper metal on the foil, adhere filament. Decorate edge of decorative frame with Sprinkles Dots, use Sprinkles Arrows on the upper right and lower left. Adhere your sentiment, light bulbs and apply embellishments. These light bulbs are so fun! Will be using them on more projects! I love, love, love art effects at the moment. I really like that every time you use the same effect, you get a different look! Its fantastic! So, this time I decided to film exactly how I created my background effect for this card and then onwards to finishing the card so ... sit back and enjoy! 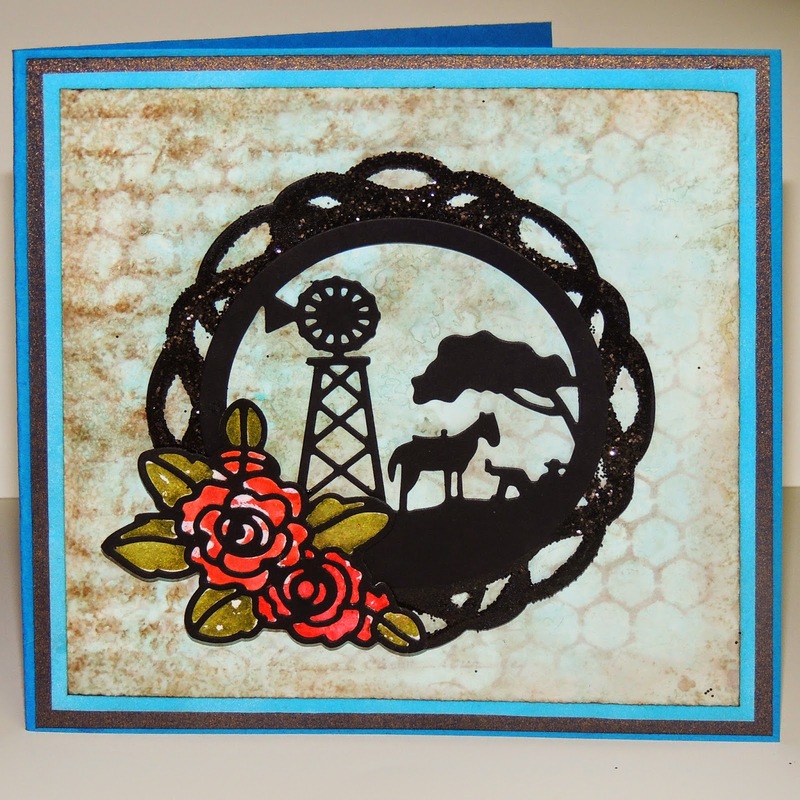 Distressed Background Silhouette Card from Sharon Jeffs on Vimeo. When I was growing up my mom worked outside the home, putting in 40 or more hours every week doing various factory worker jobs. Mom was so incredibly busy and had little time left after the cooking and cleaning, the laundry and ironing, and all the extras she had to do to take care of me and my three brothers. 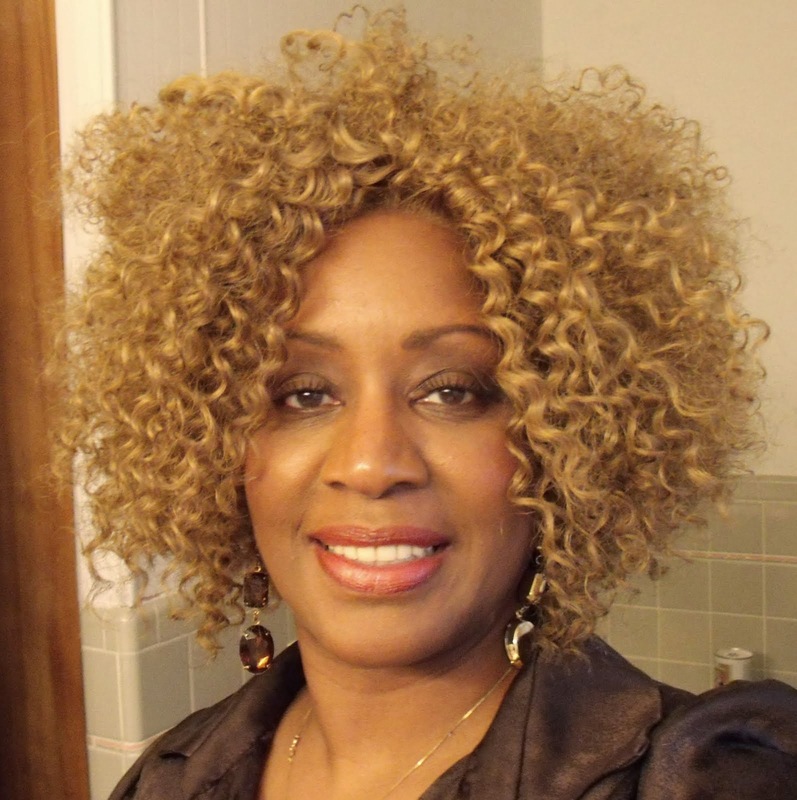 But she always found time to make me and each of my siblings feel special and loved. When I was drawing the image for this die (based on a paper-cutting pattern), and later when designing this card, I reflected on how much Mom lifted me up, emotionally and spiritually, as I was growing up. 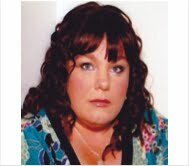 She was always there for me, and most of my success in life is due to her providing that boost whenever I needed it. This card is dedicated to Mom, who turned 87 today. To make the card I cut the Mother and Child panel out of red card-stock, light blue card-stock, and white craft foam. I glued the light blue panel to the craft foam panel using Tombow MonoAdhesive. I reserved ONLY the hearts cut out from the red panel, and pieced them into the heart holes in the blue panel. I then glued the whole panel to a piece of coordinating floral card stock, which, in turn, I layered onto a slightly darker blue card-stock panel. I then affixed it all to an embossed white panel (Anna Griffin), to another darker blue panel, and finally to a white 5"x7" card. 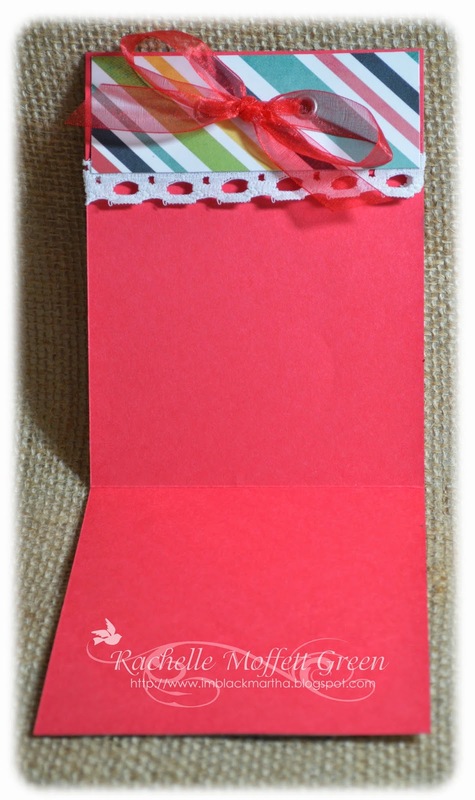 I finished the card off with a bow made from 3/4" wide red grosgrain ribbon. 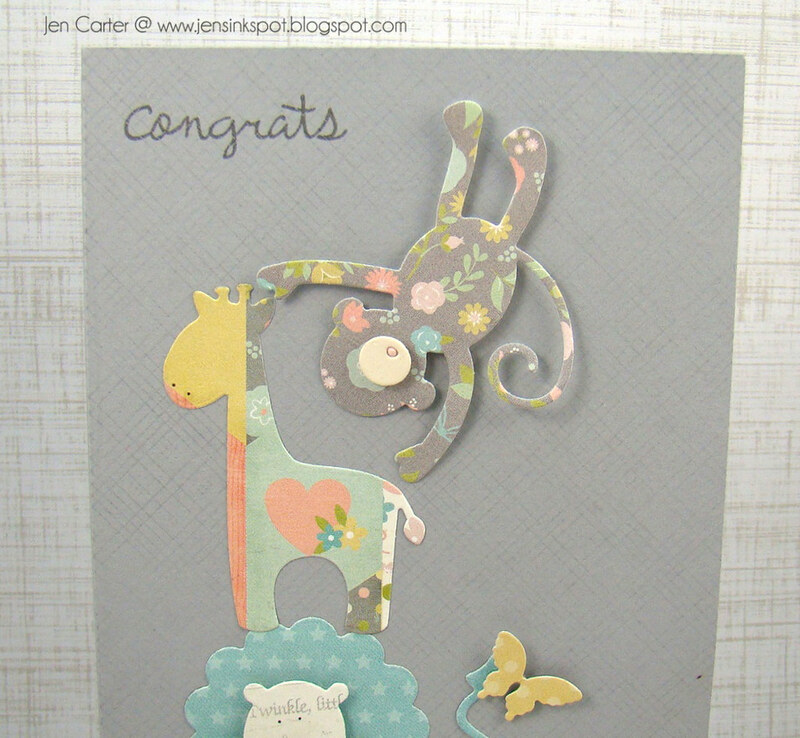 I adore (ADORE) these baby animal dies! This is the first of several cards that I'll be sharing using these dies. The first thing I thought of when I started playing with these were that they would be so cute stacked, which of course required a tall card. This card measures 8 x 4, so I cut my card base 8 x 8 to accommodate the fold. 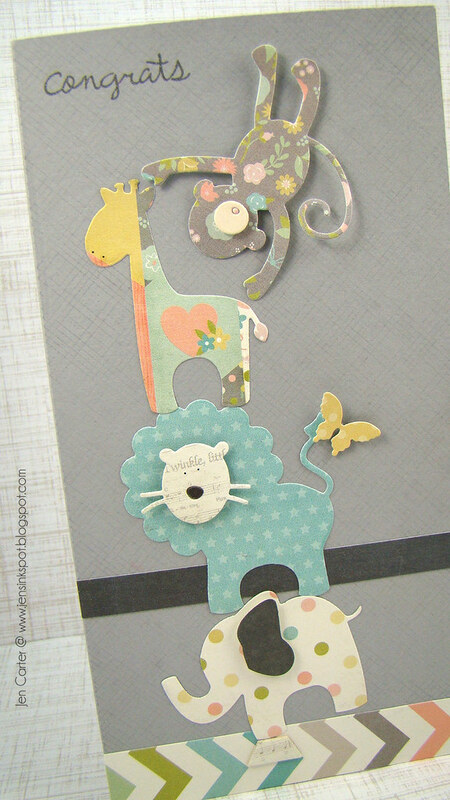 I chose some cute patterned paper for my animals and went to stacking! Do you see the base that the elephant is balancing precariously on? That is a die that is included in the die set and it worked perfectly to ground these animals. 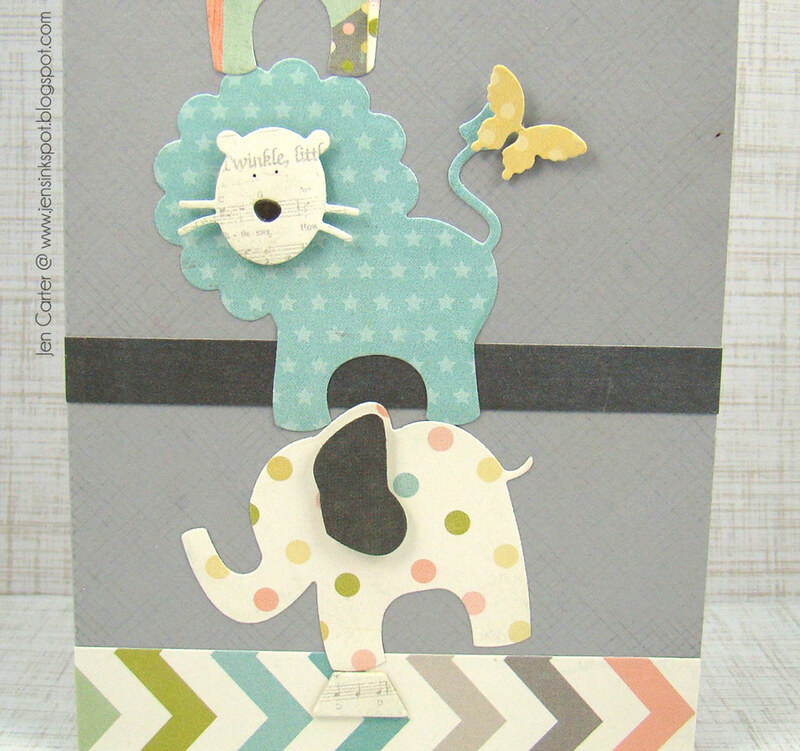 I thought it would be cute to add a little butterfly from the Petite Butterflies die set on the lion's tail! For the ear of the elephant and the face of the lion I used dimensionals to pop them up a little. There are eyes for the lion that can be die cut too but this time I used a little black pen to add eyes. The monkey seemed like he needed to be clowning around so I put him upside down as if he were swinging around. I think he is so adorable! To make him seem more 3D I adhered the top portion of him (head) directly to the card front and then I used dimensionals to pop up his bottom stomach and legs. It added a fun dimension to the animals! This die set is so fun!! There are so many possibilities, so many themes that they can be used with! I absolutely adore creating distressed backgrounds and mixing different mediums together to get unique and different results. I tend to cut a sheet of watercolour paper into smaller squares that I can experiment on and every once in awhile, I create something I adore! This card began and an experiment. I put a dollop of white, red and yellow acrylic paint onto a flat surface then rolled over it with a brayer. I then brayered over a sheet of watercolour paper and spritzed it with water. Once it was dry, I inked the edges and stamped one of my absolute favourite background stamps "Great Grandfathers Letter". The butterfly is actually an imprint of the "Solid Butterfly" die that I carved to make my own matching stamp. 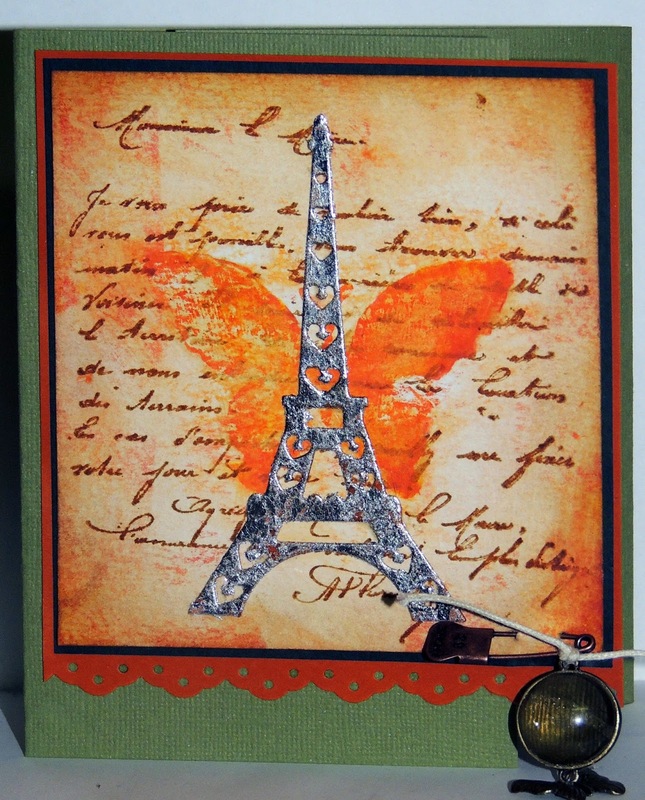 I stamped the butterfly using the same mix of paints that I'd created earlier with the brayer. Finally I die cut an "Eiffel tower" from a scrap of card stock and covered with a layer of silver leafing and Distress ink (to tarnish and age the bright silver). 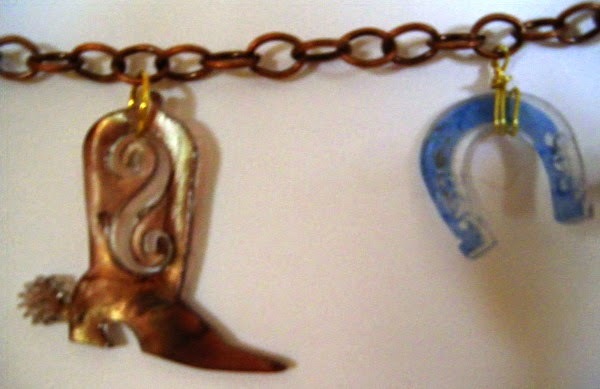 Today's project is a cute charm bracelet with icons that represent our cowboys - boots, hats and horse shoes! These cute decorations were made using shrink plastic, Spectrum noir alcohol ink pens and Frantic Stamper Precision Dies, Cowboy Accessories- three die set (FRA-Die-09123). I colored the dies with the alcohol ink pens; since this is alcohol ink, I didn't bother to sand the shrink plastic before I colored. Although I did use the alcohol ink pens before I heated my shrink plastic, I also used them for touch ups afterwards. Once I finished the shrinking and coloring, I took some gold tone jump rings and used them to attach my charms to my bracelet. Note that I didn't punch any holes before shrinking; I just used the design features as my holes. I really like the way the boots turned out. The colors and the look of long wear really fit them! I wanted something colorful on my bracelet so I chose to make the horseshoe blue. The horseshoe didn't have any holes big enough to string a jump ring through so I wound some gold-tone wire around the horseshoe and created a loop to attach to my bracelet. 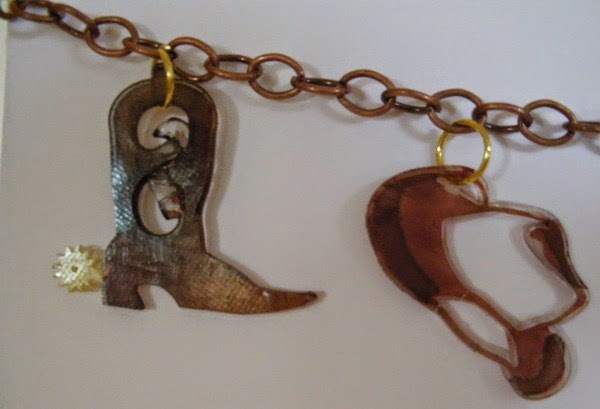 I hope you enjoyed my cowboy charm bracelet. Now go make one of your own! Start with a 4" x 11" piece of paper. Score 4 1/4" from one end and 1 1/2 from the other end. Fold as scored. With a standard punch, punch two holes 1 1/4" and 3/4" down from top on upper flap through all thicknesses. I use a template I made previously which speeds up an already fast process. After folding matchbook, I used Simple Stories Homespun and Carta Bella "It's a Celebration" design paper. Add large eyelet into the punch holes. It holds the top of the matchbook secure which will also hold the lower portion of the matchbook in place. You can easily decorate the matchbook anyway you like. I stamped the faces on the Helium Balloons (FRA-Die19-186) and then layered them together. 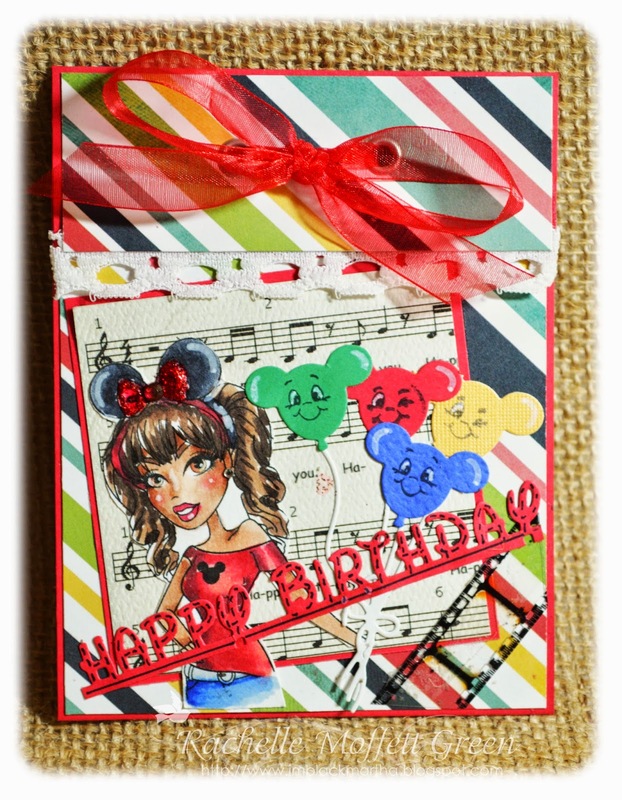 I added the Tim Holtz Filmstrip Ribbon (ADV-TH-92028) as fun element. Last but not least I used the Happy Birthday Line (FRA-Die-09182). I use removable tape to adhere gift card or cash. Try it. I'm sure you like it! 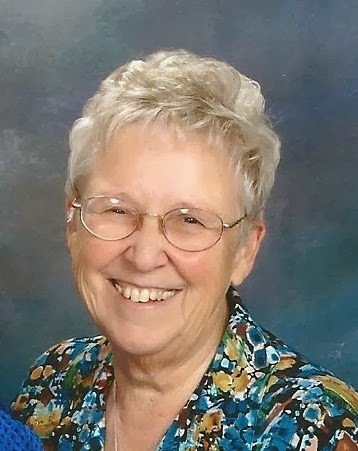 A dear friend's mother passed away recently, and somewhat suddenly. I wanted to make a card that expressed my deep sympathy for her loss; I know no card can ease the pain of losing a parent, but I still wanted to let her know that I care. I used an assortment of papers from DCWV on my simple center-step card base. The background papers set the stage for a floral spray made with Frantic Stamper Precision dies. The flowers were made with the Frantic Stamper Petite Layering Posies Precision Die. They were cut from patterned paper and lightly sponged around the petal edges with a pale pink ink. Next, they were spritzed with a bit of water and crumpled up from the center. When completely dry, they were partially opened and glued together at only their centers, layering two medium sized flowers on each of the larger ones. When my flowers were complete I glued them to a base made with three of the leaves cut with the Petite Leaves die, the Open Spring Sprig die and the Solid Spring Sprig die. Since the finished card is square and I had no square envelopes, I used my envelope punch board to create a matching envelope for the card. I think the envelope really added a nice touch to the finished card. I can't tell you how excited I am to be posting today! I am thrilled to be guest designing with the Frantic Stamper design team for several months. Yippee!! To say I'm in love with their exclusive dies just wouldn't quite sum up how much I adore the collection! 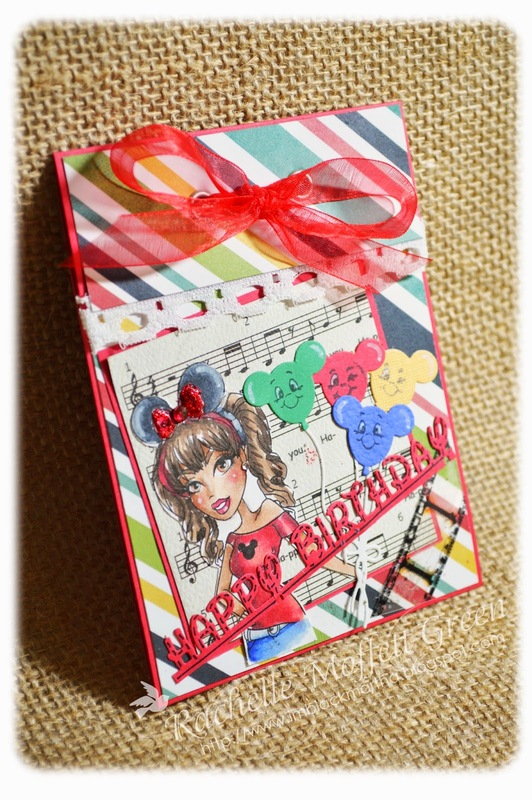 I was tickled pink when I first put my eyes on this card panel die! 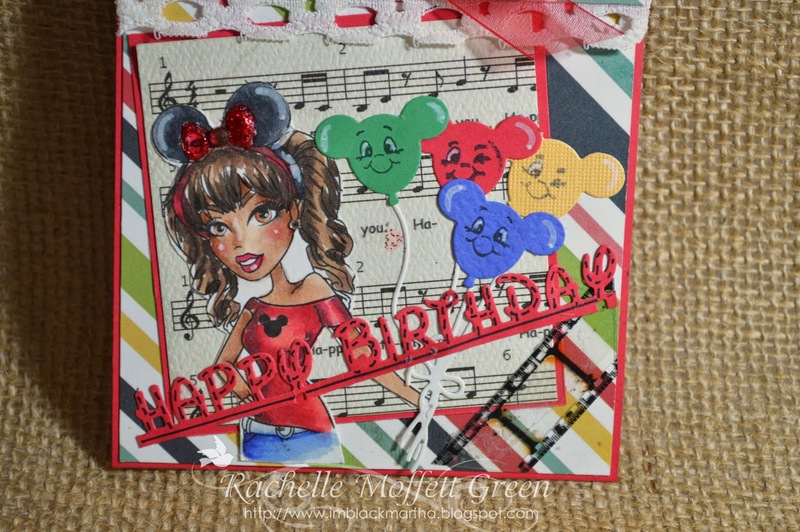 To create the background of this card I used Frantic Stamper's Alternating Diagonal Card Panel die. This die is wonderful!! Can you imagine the background designs you could create with this? I'm dreaming of colors and patterns right now! I am drawn to camera images, and camera dies are just icing on the cake! I love this little camera die that is included in the Frantic Stamper Instant Camera 3x4 Photo Card dies set. It is so adorable! I die cut the camera once in cream cardstock and then a second time in gold cardstock. It adds the classy details while still keeping the focus on the camera. ;The smile die (isn't the size of this one perfect!) from the Frantic Stamper Diagonal Stripes 3x4 Photo Cardis also cut from gold cardstock. To create the bokeh-like effect that you sometimes get with photography I punched several sizes of circles from vellum and added a few clear sequins. I really like the end result! Thank you so much for visiting today and for allowing me to share a part of the day with you! For the next three months the Frantic Stamper Design Team will have a new member. 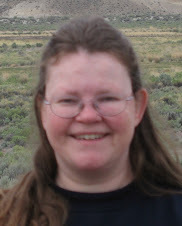 Welcome to our Guest Designer, Jennifer Carter! Here is a little about Jen in her own words. I am so excited to be guest designing with Frantic Stamper! 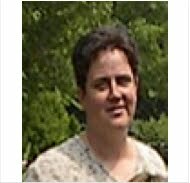 My name is Jen Carter and I am a wife of 17 years to Dwight, and a mom to Mason who will be in 6th Grade this year and Sadie who is going into 1st Grade. My husband is the Lead Pastor at our church. I am very involved in our church as well and have led our Women's Ministries for quite a few years now (this coming year I'm taking a much needed break!) and also have been very active in our children's ministries in various ways. I love serving the Lord! 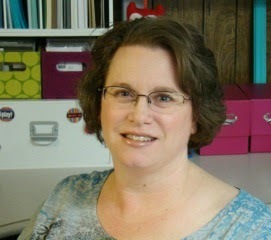 I work part-time as a Secretary at our elementary school and I enjoy my job very much! I am so blessed to be able to work where I can see and be a part of my children's lives on a daily basis! I started scrapbooking in Junior High and then later in life transitioned into stamping and card making. It is such a joy for me to be able to spend time with my papers, inks, stamps & dies! I have a very Clean & Simple style to my work but find I also like to change things up from time to time! 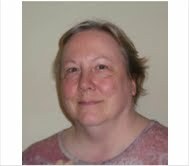 I am so inspired by Fran's line of precision dies and am very excited to be able to work with her and her team! Look for projects from Jen here and on the Frantic Stamper Facebook page through the end of October.